This post was voted one of the must read posts of 2016 by Asian Tours and Holidays! 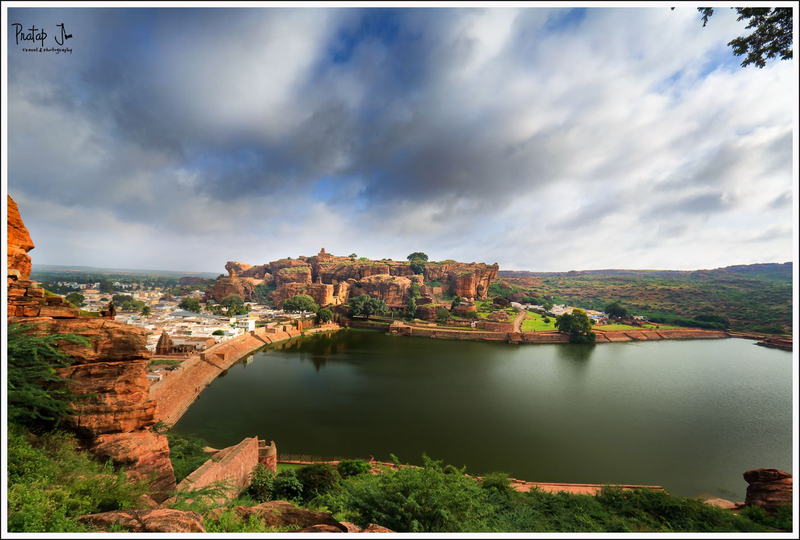 The idea of visiting Badami crossed my mind many times. 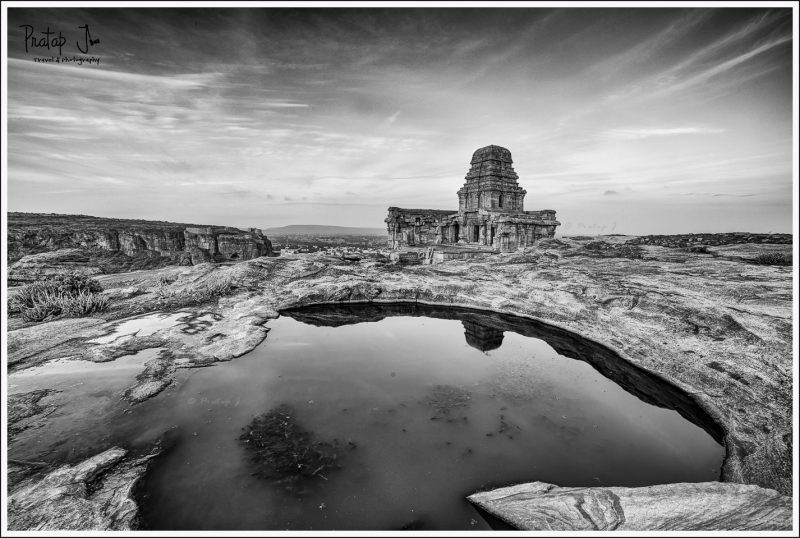 However, I had never traveled past Hampi until the August of 2015. 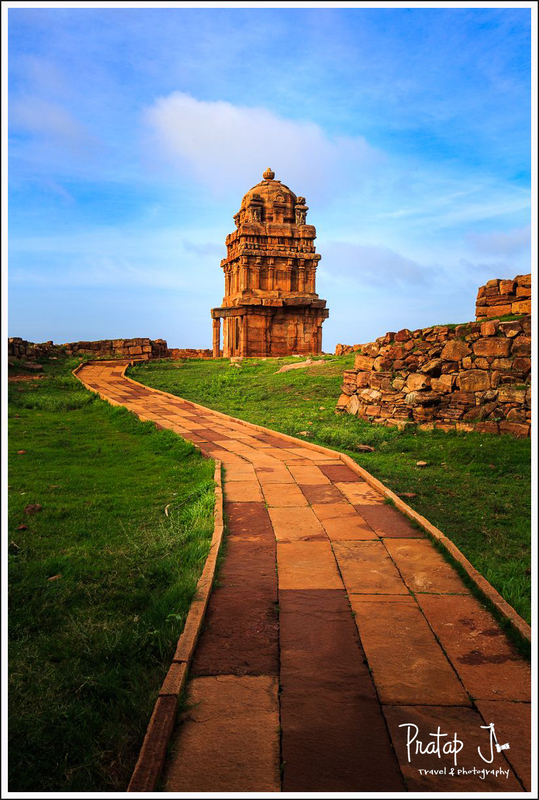 A few friends and I hatched a plan to visit Badami for which we picked the weekend of the August 07th and made it happen. We decided to drive from Bangalore, which is all of 560 odd km. This meant spending a good part of the day on the road. We left Bangalore at around 5 am, and made our first halt at the world famous shack that serves authentic Benne Dosa. 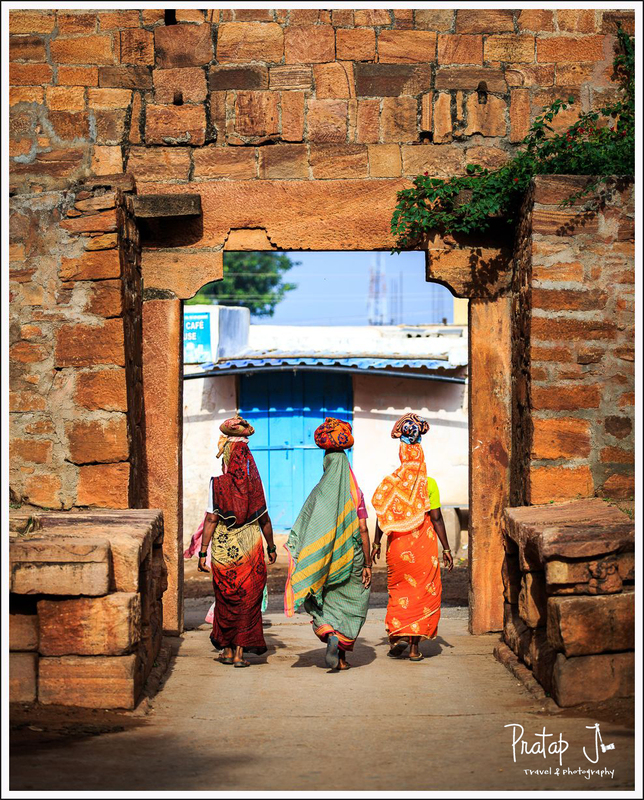 If you have read my Hampi travelogue, you’d know about my obsession for authentic tasting dosas. And oh, let me clarify what I mean by “world famous.” I had discovered this shack around 3 years ago when we made a trip to Devarayanadurga. Those days, Google permitted anyone to add points on interest using the map maker feature. I promptly added this shack on Google hoping to make it world famous. So if you are reading this, please go to the shack and contribute to its popularity! For the love of dosas and to ensure that we did not miss going to the source, we took a detour and drove into the town of Davengere to eat at Sri Guru Kottureshwara Benne Dosa Hotel. The benne dosas here are really drool-worthy. This meal doubled up as our brunch because we had a good 250km more to cover. Close to the dosa place is a Cafe Coffee Day where we stopped for a caffeine fix. 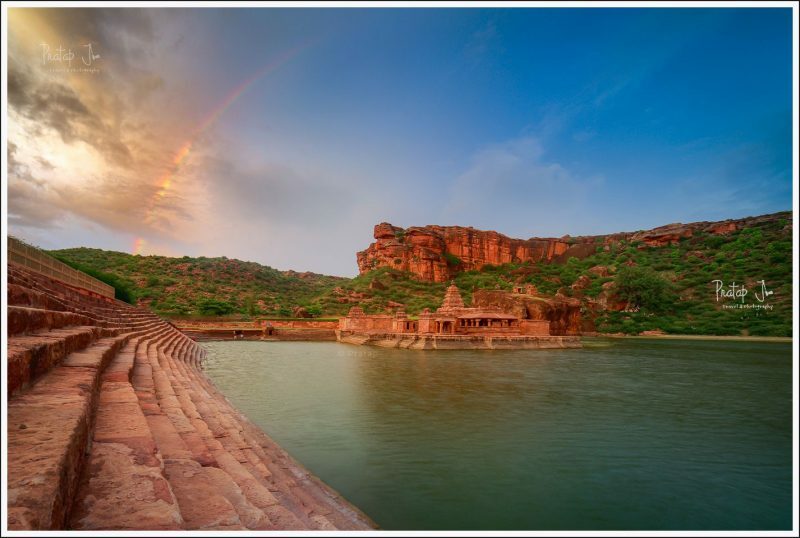 I wouldn’t blame you if you have started wondering if this travelogue is going to have anything to do with photography, or Badami for that matter. 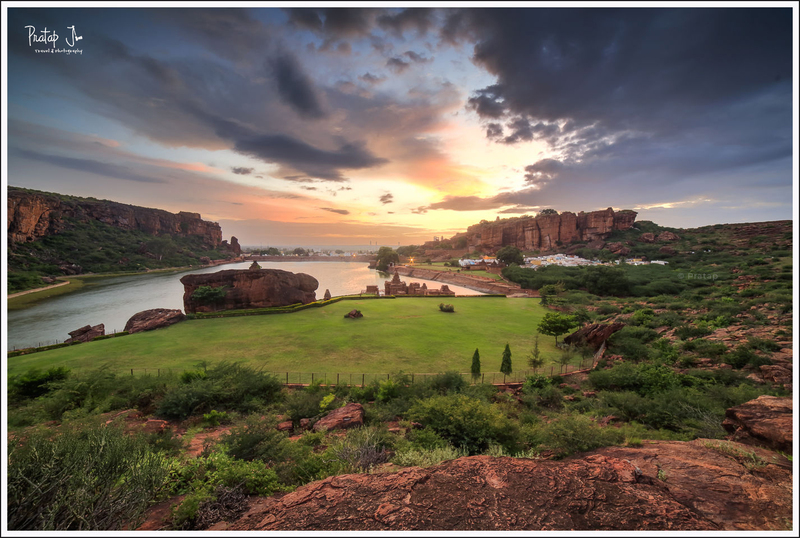 It is just that I had to justify our decision of driving down to Badami. The distance is certainly something to consider. An overnight train would make sense for most tourists. 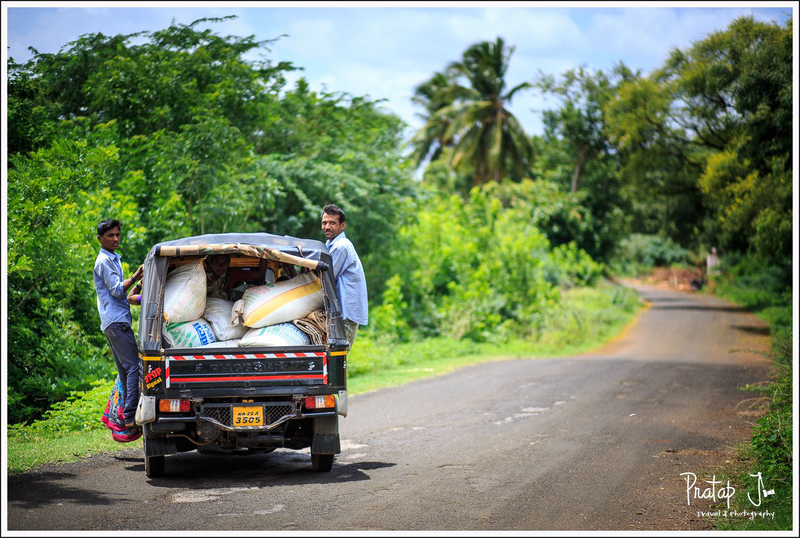 After Hubbali we drifted into a poorly maintained State Highway which made our life miserable. There seemed no end in sight for the journey which was supposed to take ten hours. 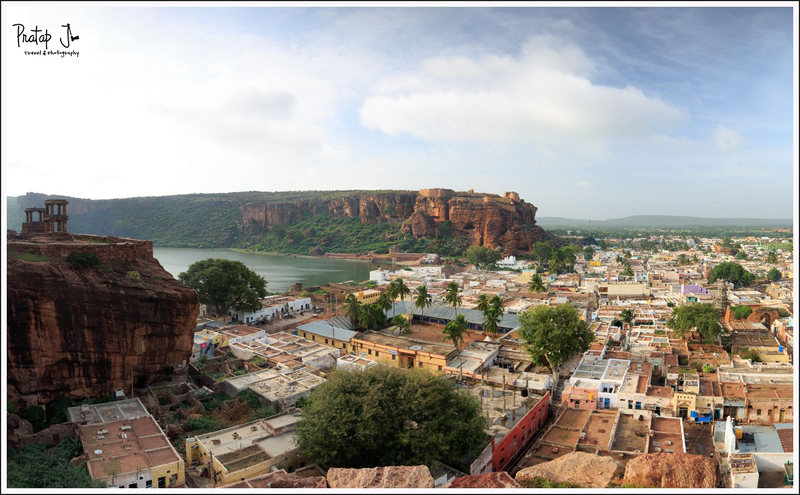 We finally reached Badami at around 5 and checked into the Heritage Resort. This is a nice place to stay, a little away from the main town and overlooking an unnamed hillock. 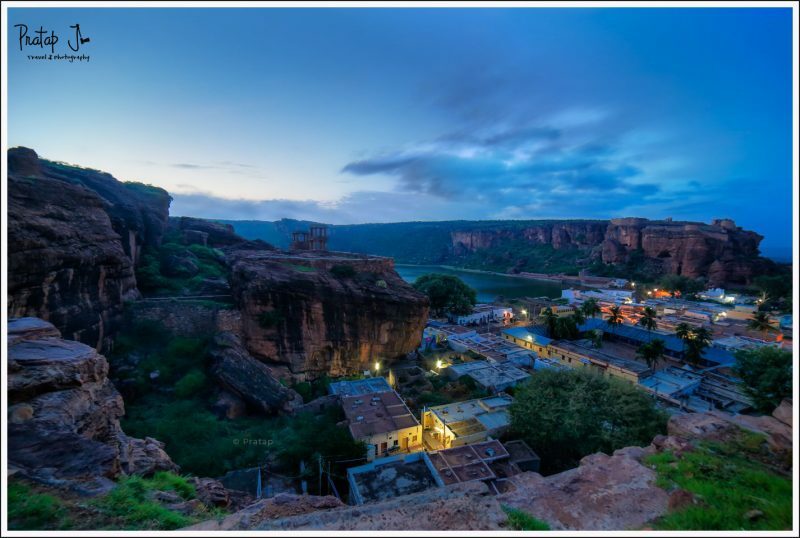 We had experienced overcast skies through most of the day and we witnessed light showers as we neared Badami. After checking in to the resort we left immediately to shoot at the Agastya lake. This man-made tank is around 5 km from the Heritage Resort. Our small car easily navigated the historic lanes that lead up to the lake. The view as breathtaking – vast and surrounded by impressive red sandstone mountains, Agastya lake transported us back in time. The Bhutanatha temple stands by the shore of the lake at the far end, just beneath a rugged mountain slope. Crumbling fort walls run along the side of the mountain at the other end, as if guarding the sanctity of the place. One can’t help but wonder how this place would have looked in all its glory during the reign of the Chalukyas. It was close to 6 pm when I took my first frame. The light was fading fast. I was mentally composing frames to shoot during the golden hour of sunset. Just when we got started, an ASI guard yelled at us to remove our ‘stands.’ Use of tripod isn’t permitted around the Agasthya lake. In the next few days we were to discover that it is okay to do pretty much anything near the lake – except use a tripod. We saw ladies washing clothes, men fishing, local villagers answering nature’s call, monkeys…err…I will let you interpret from the photo what the monkeys were up to. So yes, no ‘stands’ allowed. Handicapped without my tripod, I tried various balancing acts to keep my camera steady. There was another group of photographers near the Bhutanatha temple, but they did not stay for long. Beyond 6.15 pm, it was mostly us and a few locals. This is when the Gods decided to treat us with a rainbow. Though faint, this meteorological phenomenon provided a gorgeous backdrop to the Bhutanatha temple. The ASI guards were between shifts, so we merrily used our tripods. 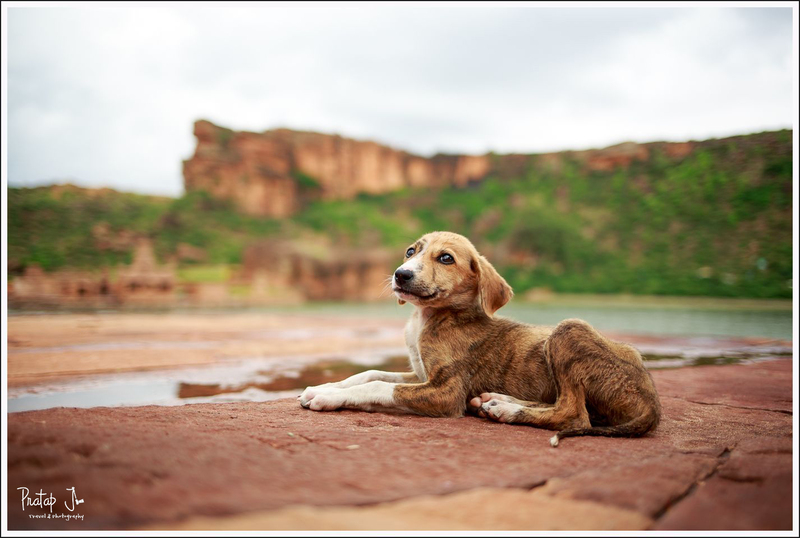 On the very first day at Badami, I got a once-in-a-lifetime photograph! Later that night, we retired early after having dinner at the resort. The food was just okay, but we did not have very high expectations anyway. We looked up some coffee table picture books available at the resort to get an idea of the places for photography. 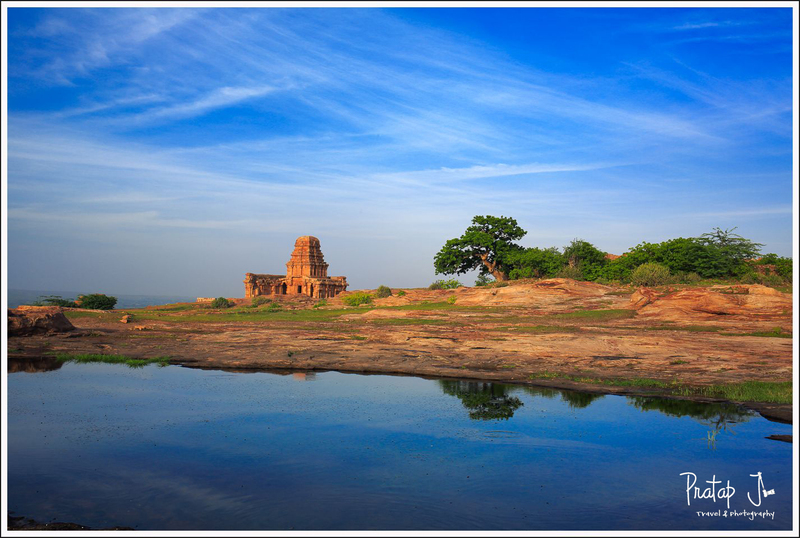 I wanted a panoramic view of the Aghasthya lake and the Bhutanatha temple. We mentally made note of a view vantage points but were unsuccessful in getting any concrete information about where to go for the kind of shot I had in mind. Plans to shoot stars that night were shelved because we were all tired after the long road journey. The rooms at the Heritage Resort are huge and comfortable. The weather was pleasant and air conditioning was not really required. Sound sleep followed. 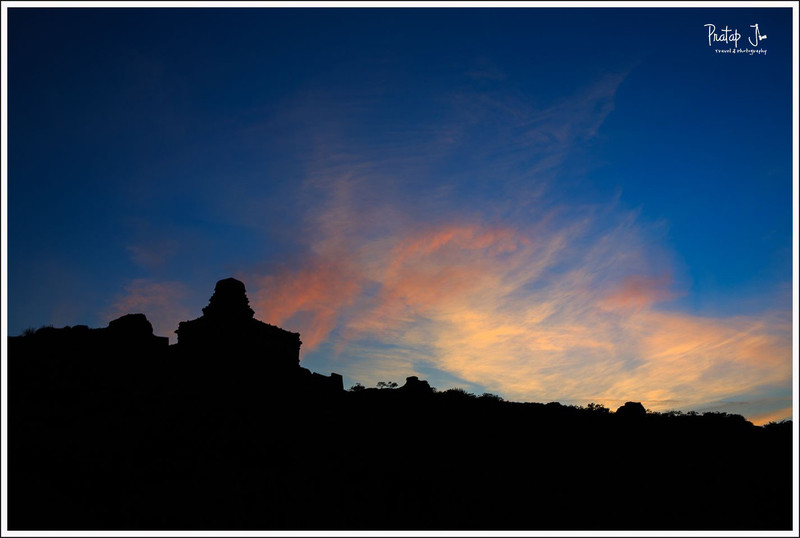 The next morning, we were up early to go to the fort situated to the east of the Agastya lake. I was hoping to catch a panoramic view of the of the oval shaped lake. We left the hotel a little after 5 am and drove to the same place where we shot the previous evening. We weren’t sure if the entrance to the fort would be open. 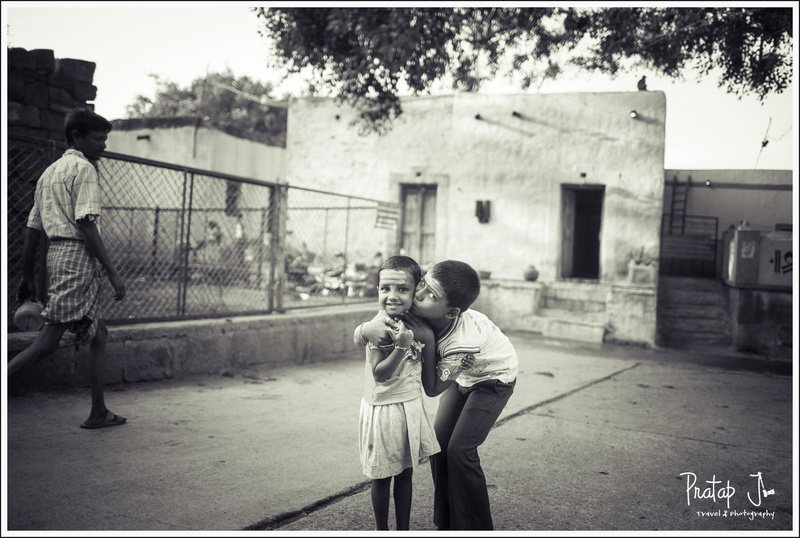 After inquiring with a few locals, we decided that the best thing to do would be to see for ourselves. Just then an ASI guard appeared out of nowhere and told us we are free to enter the fort. So up we went. Every step up to the fort took us back further back in time. It was amazing how the Chalukyas had integrated the pathway leading up the mountain into the geography of the location. 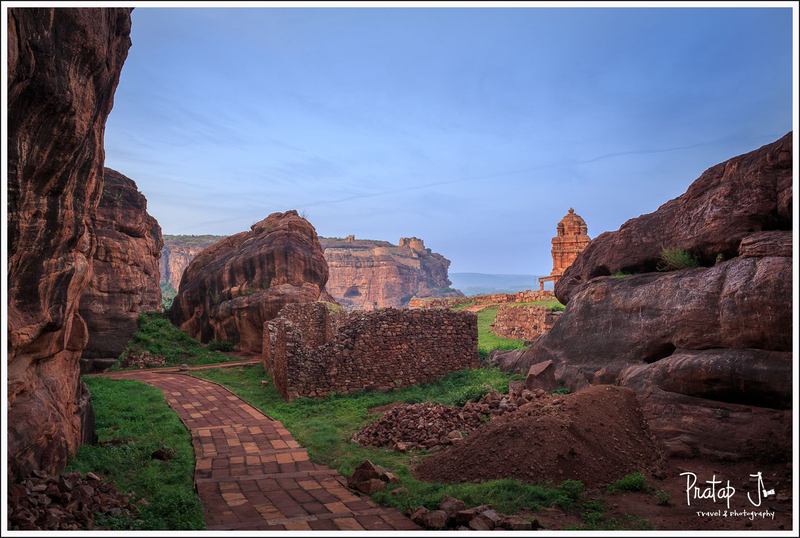 Badami was the headquarters of the Early Chalukyas, who ruled much of Karnataka in the 6th – 8th centuries The path was laid with neatly cut stone which blended nicely with the rocks. We took about half an hour to ascend. Once on top, we realized that a deep gorge ran all around the mountain cliff. We couldn’t find a way to cross the gorge. This restricted us from finding a vantage point for the photograph I had in mind. The temple is formed of a sanctuary, a square columned hall and an entrance porch . 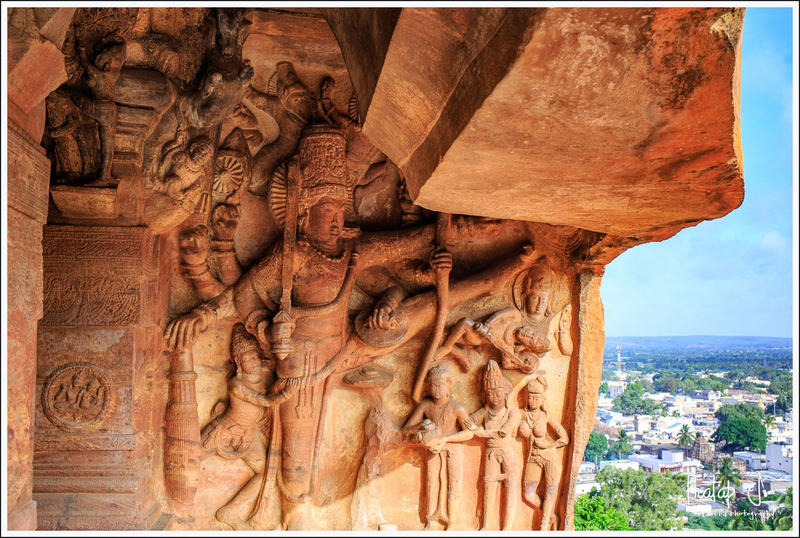 The base is richly carved with friezes of mythical animals in a southern or Dravidian style. The outer pilastered walls of the hall have sculpture panels in the projections depicting images of Shiva and Vishnu that, unusually, have moustaches. Pierced stone windows in the recesses of the walls are surmounted by foliated makaras, aquatic monsters. The multi-storey roof over the sanctuary has an octagonal dome and is decorated by miniature edifices and kudu or arch motifs. 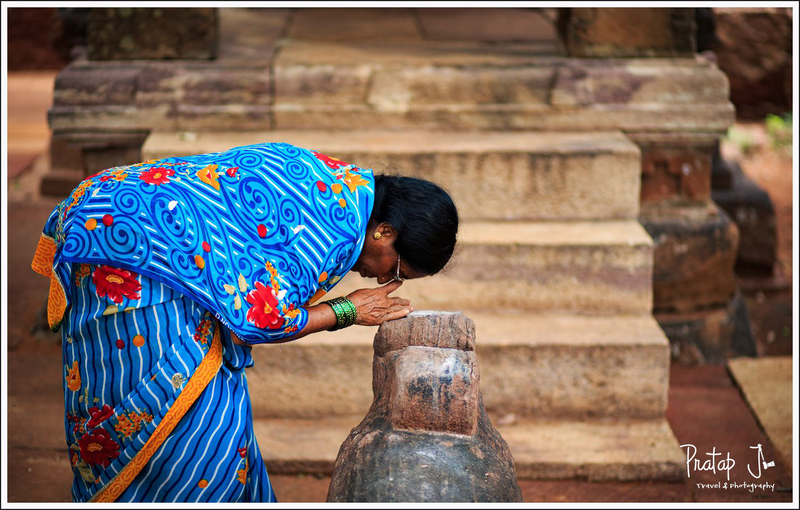 The sanctuary itself is home to a large linga. We wandered to the other end of the mountain hoping for a good view point. Finding nothing, we hiked down through a narrow path which didn’t seem frequented by humans. We ended up in the Mahakuta pathway and finally walked down the mountain. We had basically completed one full circle. Though one side of the mountain had so much to see, the other side was barren. The natural fortification was only on one one side. The other side of the mountain could be easily trekked. 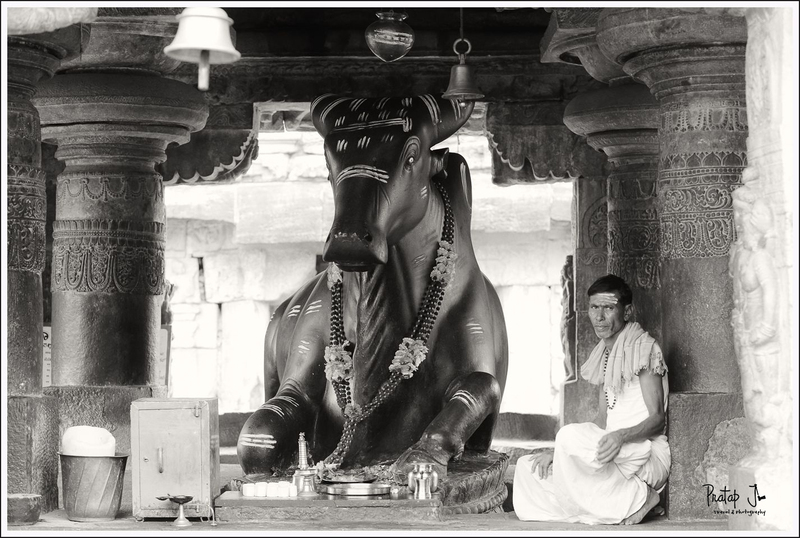 This made me wonder what sort of defense systems the Chalukyas had on the other side. Nevertheless, the morning was well spent. We enjoyed exploring the place and not having to mingle with tourists. It was around 9 am when we got back to the room for breakfast. 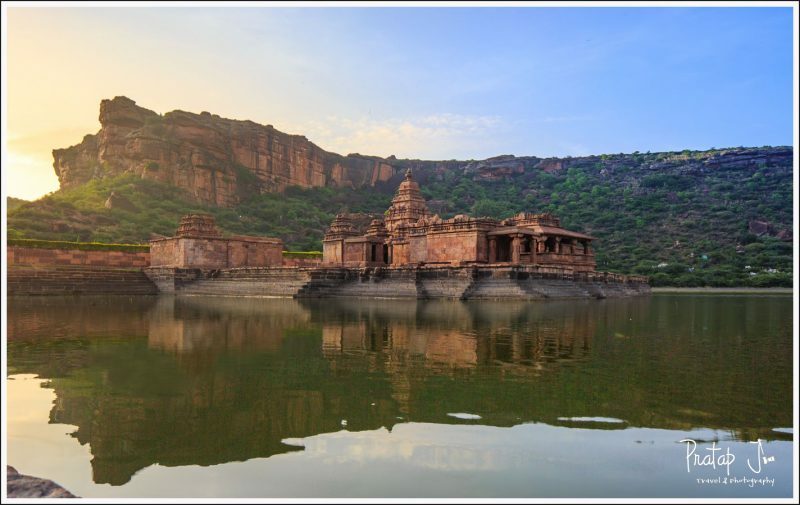 After relaxing for a bit, we went to the Badami Cave Temples. It was mid-day and not the best time to take photos. The Cave Temples were captivating in their own way. 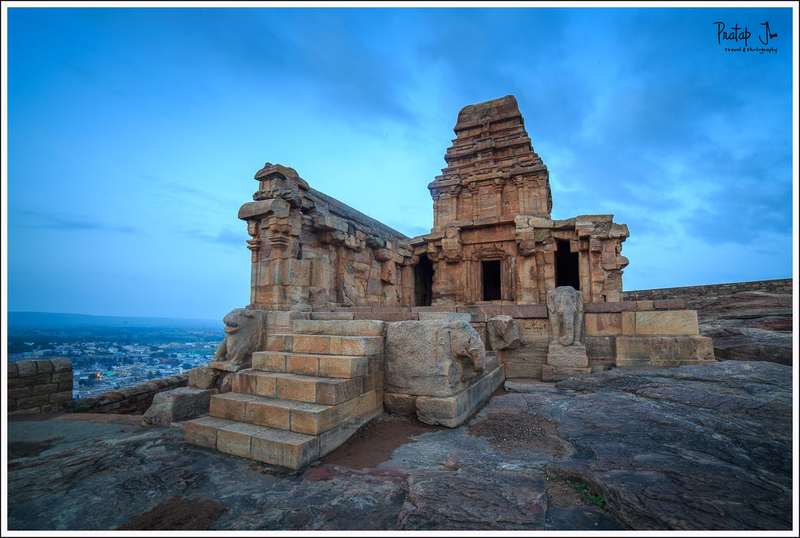 One can’t help but wonder how our ancestors magically transformed rock into architectural marvels way back in 578 AD. 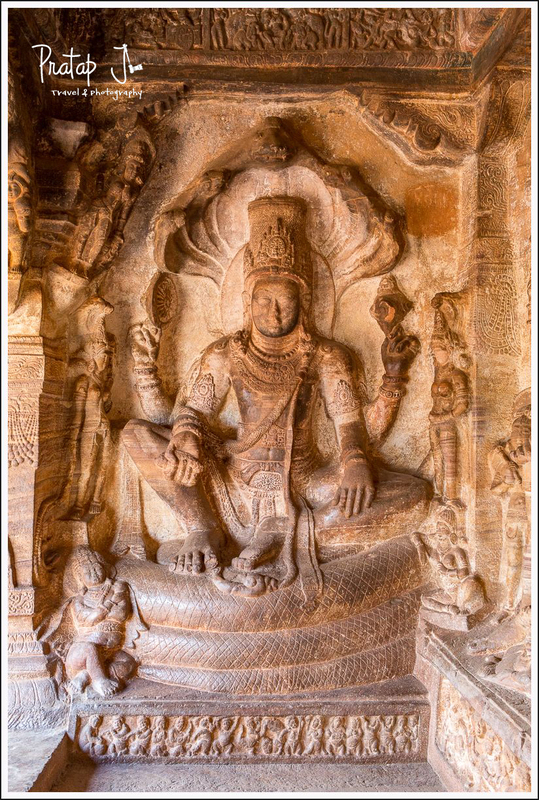 The pillars were cut with clinical precision and the caves showed how the rulers were tolerant to Shaivism, Vaishnavism, Buddhism and Jainism. From the Cave temples, we left for Mahakuta. It was mid-day and the sun was harsh. We were told to watch out for sunflower fields en-route. We did find a few, but nothing too enchanting. It took us about 45 minutes to reach our destination. dozen lingas inside the premises. If people-watching is your thing, you can spend the entire day at Mahakuta. 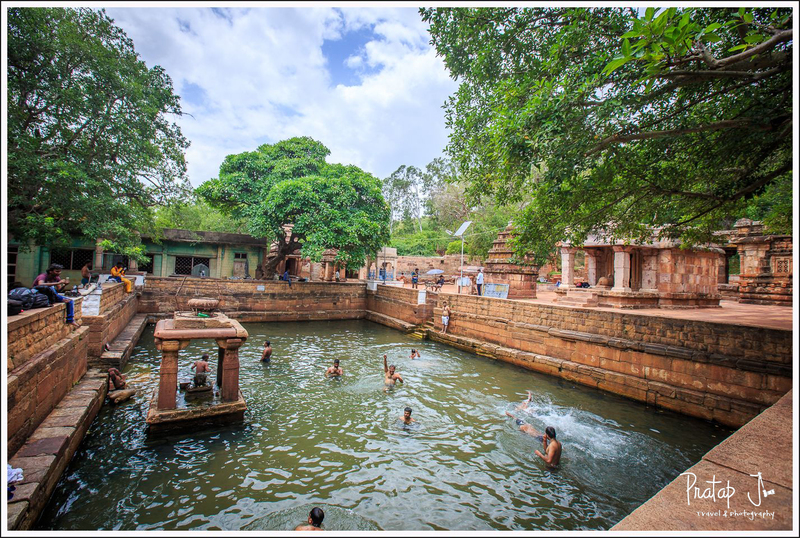 We unfortunately did not have the luxury of time, so we moved on to Pattadakal. We were quite famished when we reached Pattadakal. There weren’t any good restaurants in sight, so we had some local delicacies in a shack. The food wasn’t something to write home about although it filled our empty stomachs. 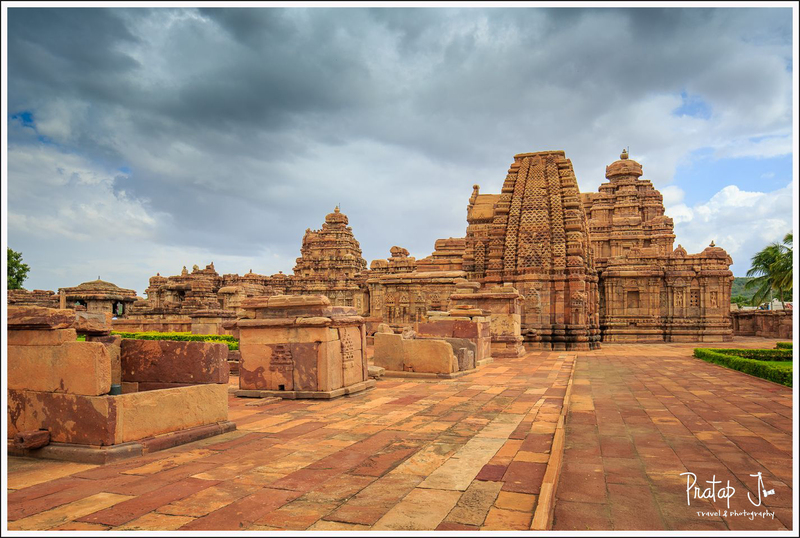 The Group of Monuments at Pattadakal is a UNESCO World Heritage Center and is spread over a larger area than Mahakuta. The Malaprabha River flows to the north. The temples are all aesthetically built and a harmonious mixture of different styles. We noticed that the Archeologically Survey of India thinks it is okay to mark the temple artifacts with horrendous white color paint while we weren’t even allowed to carry a GoPro. Unfortunately we can’t really argue with this logic because this is India. Ensure that photographers don’t use tripods. Every guard we encountered seemed to get anxiety attacks looking at us. Maintain a garden in and around the archaeological sites while ignoring the open desecration of the ruins in the form of development. Put up a board than warns tourists of the powers ASI has to invoke some outdated law instead of putting up something that is educative and informative. Of course, these laws were never enforced. 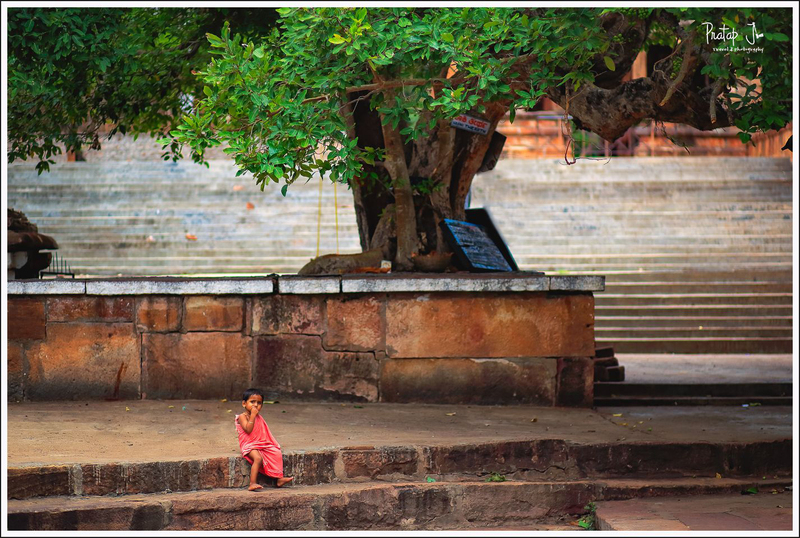 From Aihole, we drove back to the room for a quick break. The day was not done and we had one more opportunity to shoot during sunset. So off we went to the Agastya lake once again with a more adventurous plan of hiking up the mountain behind the Bhutanatha temple. Our agenda was to get to a vantage point from where we could capture the Bhutanatha temple, Agastya lake, and the sunset behind the Northern Hill. To achieve this we had to make our own trail. While climbing up through the rocks we met a young man at three fourths the distance. He was coming down with his wife and kids. 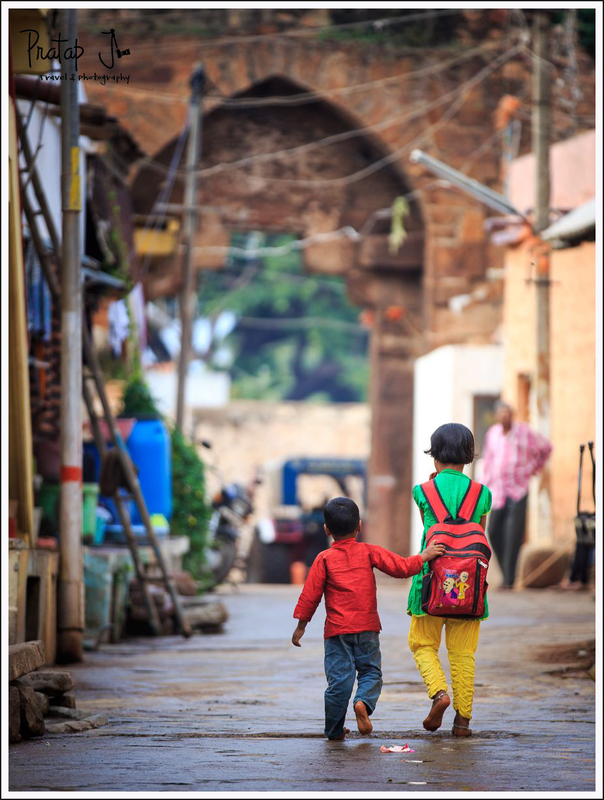 One child was on his shoulder, while another two were walking with his wife who was carrying picnic material. We had a quick word with him and learnt that the hiking path lead to a lake above the mountain behind the Bhutanatha temple. We were awed by his sense of adventure and strength to go up all the way with his family. He recommend we visit the place on another day as it was already late. 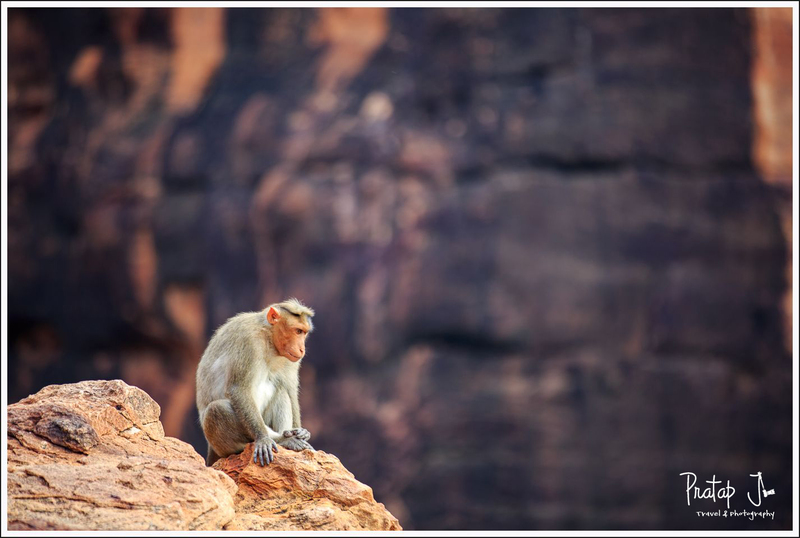 After thanking him, we scouted around nearby for a view point nearby and perched ourselves on the edge of a rock. From there we witnessed a brilliant sunset. The weather gods were certainly with us on this trip! After a satisfying shoot during which we got unique photos, we were back on the road to find a place for dinner. A quick google search later, we were eating at a restaurant called the Lemon Tree. The food was better than the Heritage Inn although not on the same level as other hotels with the same name. Post dinner we decided to drive to a little out of town in the hopes of shooting the night sky. 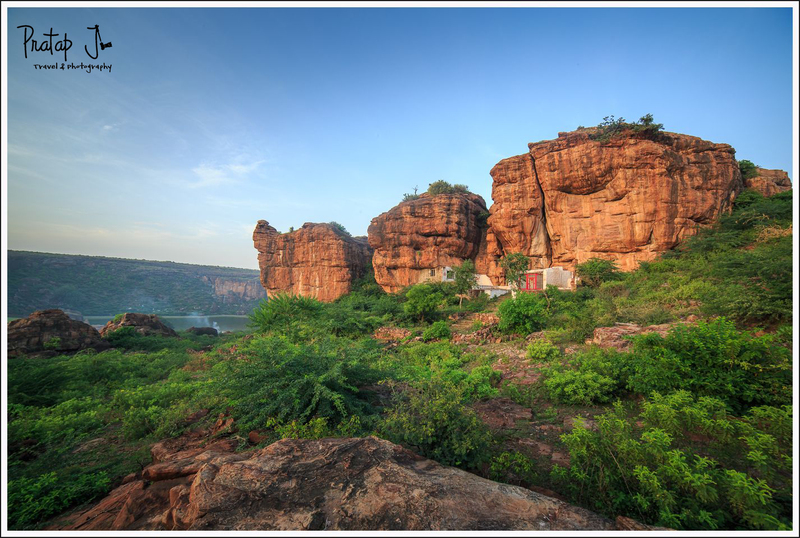 The outskirts of Badami is quite barren and uninteresting. The highway was dark and we weren’t sure if it would be safe to go exploring on foot. It was already quite late and we had to travel back to Bangalore the next day. Not feeling very optimistic we turned around after a while. 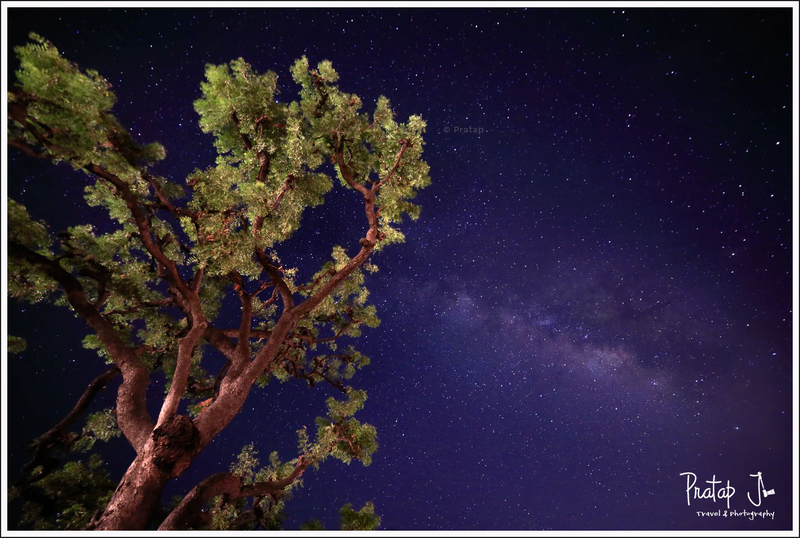 Just as we did that, I took one last look at the sky and saw something that looked like the star dust of the milky way. I couldn’t believe my eyes. We got down to shoot the stars against a tree by the side of the roads. There were vehicles occasionally passing by so we had to time our exposures to avoid the glare of the headlights. After several attempts, I got this. With this shot I ended a very successful day of shooting. The next morning only three of us were up to go back to the Northern hill near the Agastya lake. Our first visit the previous day was too hurried. We took it easy that morning and got some really good views of the Malegitti Shivalaya temple. It was extremely calm and I can’t decide if what I liked more – watching the sun come up or capturing the beautiful fort and ruins. We walked down from the fort and took some shots in the streets before driving back to the hotel for breakfast. After that wee checked out and left for Bangalore. These are some of the final frames from our trip. Lee Filters, Haida Filter Holder, FEISOL CT-3441T tripod, Haida ND3.0 1000X filter etc.